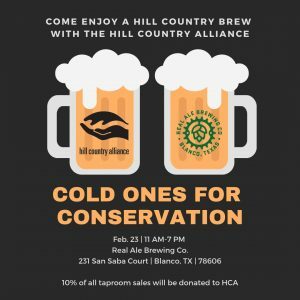 Blanco – Cold Ones for Conservation at Real Ale Brewing Co.
Come enjoy a beer in Blanco! Real Ale Brewing Co. will be open from 11-7 and Hill Country Alliance staff will be around from 12-4 to talk about our mission, what we do, and how you can get involved! Our friends at Real Ale Brewing Co. will also be debuting their new spring seasonal WALLBALL, an India Pale Lager. There will also be food on deck by Bubba’s Brat Haus. 10% of all taproom sales on 2/23 will go to support the the Hill Country Alliance. Come by and show your support!